Six broadsides and leaflets concerning the plan of the British to deport illegal immigrants on the ships Milos, Pacific and Atlantic to Mauritius, and five postal items sent from and to Mauritius detention camp. Palestine, 1940; Mauritius, 1941-1945. The ships Milos, Pacific and Atlantic arrived at the shores of Palestine between November 15 and November 24, 1940, carrying 3,500 refugees from Europe, among them refugees who were imprisoned in concentration camps. The journey was organized by Berthold Storfer‏ on behalf of the Central Office for Jewish Immigration established by the Nazi authorities in Vienna. The three ships were captured by the British at sea and led to Haifa. On November 25, after the passengers of Pacific and Milos and some of the Atlantic passengers boarded the Patria deportation ship meant to sail to a British detention camp in Mauritius, the Haganah organization sabotaged the ship; it sank, taking the life of more than 250 immigrants. The Jewish Yishuv managed to leave the Patria survivors in Palestine, while the rest of the Atlantic passengers, 1700 persons, were deported to Mauritius and were detained there until the end of World War II. 1-6. Six broadsides and leaflets: • Broadside dated 8.11.1940, to the "Jewish Yishuv", publicizing the intention of the British to "deport those who escaped torture… to an island near Madagascar". The broadside also declares that the "Yishuv will not let those who escaped from exile be deported to a second exile" (Hebrew). 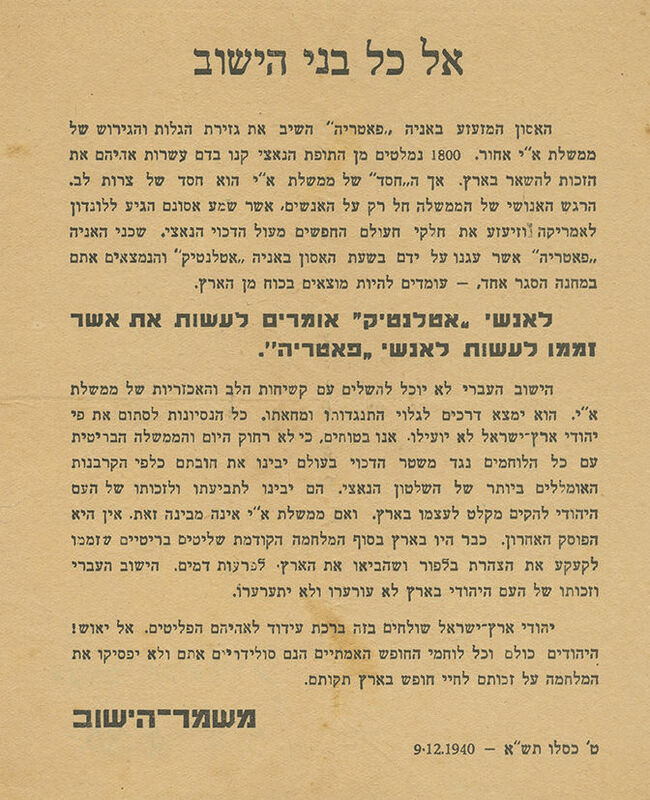 • Two broadsides on behalf of "Mishmar HaYishuv" announcing a general strike on 20.11.1940. • Protest leaflet on behalf of "Mishmar HaYishuv", dated 9.12.1940, against the British plan to deport the Atlantic passengers to Mauritius. • Leaflet on behalf of "Mishmar HaYishuv" dated 10.12.1940, calling for a general strike "against the deportation of 1700 of Atlantic immigrants". • Broadside announcing that passengers of Atlantic boarded the deportation ships. 7-11. Four postal envelopes and a postcard, with postal stamps and ink-stamps, sent by prisoners in Mauritius and to them: • Envelope sent from Canada to Mauritius detention camp in 1941. • Two envelopes sent from Mauritius detention camps to Palestine in 1943. • Envelope sent from Mauritius detention camp to a soldier in the Jewish Brigade, 1945. • Postcard with a handwritten letter (German) sent from Mauritius detention camp to Haifa, 25.2.1945. In the letter, the sender, Adolf Gerstl, informs his daughter Kathie that he was released from the detention camp with all the other detainees, however there are not enough ships and if the Yishuv will not assist, they might stay on the island for much longer. Size and condition vary. Good to fair overall condition.